I wake in the night to hear the pattering of raindrops on the caravan roof. My washing is outside, on the airer attached to the window and is almost dry. Not wishing to venture forth into the dark and rain in my night attire, I hang precariously out of the window. The window is hinged at the top so it inconveniently closes on me as I try to retrieve the almost dry socks. The rain is not going to go away. The forecast ‘occasional heavy showers’ manifest themselves into continuous torrential rain until mid afternoon. This walking lark is meant to be fun so we abandon our plans and stay in the van. The upside of this is that I make really good progress on my forthcoming One Place Studies book. Next day and for once it isn’t actually raining. We are still on the frustrating walking in both directions kick, due to the lack of public transport. We set off from Hallsands heading for Torcross. Coincidentally we see someone we know as we set off. I am carefully watching my footing as yesterday’s rain has made parts of the path very slippery. This means that I don’t spot an overhanging branch – ouch! There are plenty of early migrant geese on Slapton Ley. We read about the practice manoeuvres for D-Day that took place here, with the loss of 946 American servicemen’s lives. Back to Hallsands and we now have to move campsites. I set the sat-nav. As we head towards Dartmouth I idly wonder at what point we cross the River Dart. Ah, that would be now. We are about to head on the Dartmouth Ferry. This is clearly my fault. Not being sure if the Dartmouth Ferry accepts caravans, we make a last minute detour before we are past the point of no return. This means it takes ages to get to the new campsite. The new-to-us caravan is equipped with numerous unnecessary gadgets, including legs that descend automatically. That would be automatically and incredibly slowly. There is no way of over-riding the automatic leg descending thingy. It also means, if the mechanism fails, there is no alterative method of making the legs do what they need to do. Once descended, the legs then take another millennia to, theoretically, level the van. The bleeping noise, that signals descended and levelled legs, finally sounds. I do not have a spirit level about my person but no way are these legs level. I test my theory by rolling a can of rice pudding rapidly across the caravan floor. There is nothing for it but to raise the legs and start again, as we get gradually colder waiting outside for the caravan to cease being legless. Next day and at last we can walk in one direction, without having to retrace our steps. We set off for the bus stop in order to get the bus to the start of the walk, with the intention of then walking back to the car that is parked by the bus stop. I am not in Martha’s league but I do like to leave plenty of time on occasions like this, especially as there is only one bus an hour. Even by my standards, we leave early, to the extent that I am worried what we will do whilst waiting for the bus. There is thick mist and we have completely failed to take account of the fact that we have to drive through Totnes during rush hour. ‘Drive’ is probably a misnomer, as we spend most of our time at a standstill in grid-locked traffic. We make the bus with minutes to spare. I have not been looking forward to this walk, described as ‘strenuous‘. In fact it isn’t nearly as bad as expected. The first two miles along the bar at Slapton and are beautifully flat. We seem to be able to walk about as fast as the local toilet cleaning man can clean toilets, as we see the same man and van at no fewer than three toilets en route. Then up a steep but manageable hill before emerging on to the road. Our instruction book warns us that this stretch is ‘frankly unpleasant’. Chris is waving a high viz jacket in an attempt to stop us being flattened by traffic as the road is busy, narrow and lacks pavement. He is not actually wearing said high viz jacket on the grounds of temperature. Just as I am thinking that this isn’t too bad, we encounter a valley whose sides must be at a gradient of 1:2. The local sheep all have two legs shorter than the other two. The photographs do not give a true indication of just how steep this was. I debate sitting down and sliding. At the bottom we pass a couple traversing the valley in the opposite direction. We are a little disconcerted when the woman says she is recovering from heart surgery. Nonetheless she makes it to the top of her side of the valley more quickly than we do and appears to be still standing by the end. I need to occupy myself during what is meant to be my holiday, whilst hsf is performing. The production team are scoring highly for food provision but low on verisimilitude. Hsf is a little disgruntled because the characters are wearing modern clothes but nineteenth century cork lifejackets. 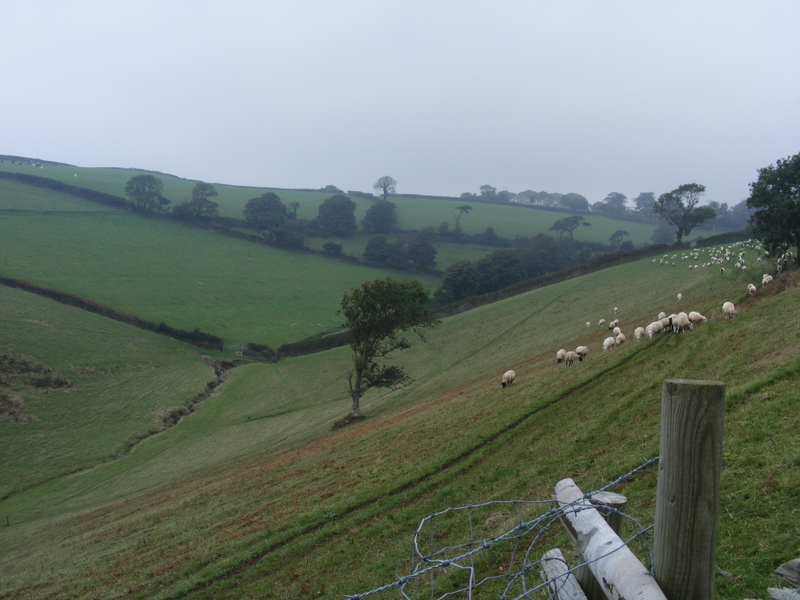 There is a Devon History Forum meeting in Exeter – mmm Exeter – takes some organising this. Plan B was put in to place, which involved me driving to Tavistock and scrounging a lift to Exeter from there. It also meant that I had to leave home very early, before daylight. I haven’t driven the new-to-me car in the dark before. I manage to locate the lights. I have a little more trouble with the CD player, which worked last time I tried it. Once I’d actually turned it on it was fine. Great to have Fishemen’s Friends’ rousing sea shanties to accompany me across Dartmoor, just in time to see a glorious misty early autumn sunrise. The History Forum included a presentation from graphic designers who create touch screen and static interpretation boards. We also heard about a great oral history project, centred on Dunkeswell memories from the Second World War. These networking sessions are always useful, just a shame that there weren’t more groups participating in the day. On the way home, sunset across Dartmoor this time, I discover that my new-to-me car appears to lack any reversing lights. On narrow Devon lanes, with a larger than usual number of people coming the other way who have no reverse gear at all, this is a touch problematical. Two full days of filming for hsf over and at last, we can head for south Devon, to try and get a little further along to south-west coastal path. We leave late and encounter mist and diversions. One of these diversions takes us up a road that is narrower than the caravan. A bit of judicious reversing is required. In the interests of global warming and my sanity, we have left my car at home. 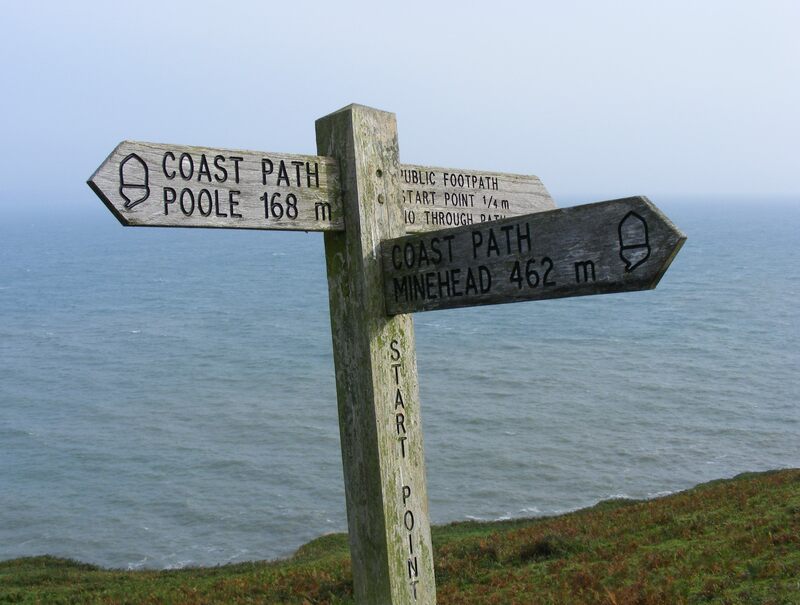 Owing to a distinct lack of public transport, trying to accomplish this week’s walks with just one car requires an unsatisfactory amount of having to walk stretches of the coastal path in both directions. Diversions seem to be somewhat of a theme, as our first walk consists entirely of a diversion, due to a cliff fall. The diversion takes us a very long way round, inland. Not only do we have much further to walk but there isn’t even any coast! Added to that, a farmer has, he claims legally, diverted a bridle way, meaning that what should have been a walk of a couple of hundred yards becomes at least three times that. After walking for seven miles we are now three miles nearer to final our destination in Poole. The next day, we park at Hallsands to walk from Lannacombe to Hallsands. Another annoying stretch where we have to walk there in order to walk back. A stiff breeze as we walk along the rugged coastline. A few more fellow walkers on this stretch. Hallsands has an interesting history. The fishing village was sold off, primarily to the tenants, when the owner died in 1857. In the 1890s dredging for shingle commenced nearby, in order to provide raw materials for development at Devonport dockyard. Total disregard for the impact that this was having on the tides, meant that storms had a dire effect on the community at Hallsands, which was lost to the sea in 1917. Quite an achievement to think we have now covered 462 miles of this wonderful coast, in the right order, without missing any bits. It has taken us ten years though. Lots going on this week. Firstly, I am thrilled with the success of the inaugural meeting of Buckland Brewer History Group. Our venue was full and people were so supportive and enthusiastic – we can’t wait to put all our ideas into practice. Great to have such a hard working band of assistants on this one. Three days in the seventeenth century then another weekend, another county. We head off to Somerset for me to speak about life in 1851 at the Annual Conference of Somerset and Dorset Family History Society. This was supposed to be the start of two weeks away but owing to my travelling companion’s burgeoning film career, we are required at home next week. This is a story worth telling. My travelling companion, a.k.a. a fisherman of my acquaintance, is approached, whilst minding his own business and is asked to present himself at the local Village Hall. Always one to do as he’s told, he turns up, along with hordes of wannabes, at the auditions for an advert for a well known brand of frozen sea food. He is allocated number 1066. I’m not saying there were 1065 other people there but it felt like it. He has his picture taken, he is signed up with a casting agency, he waits three hours, he is given a script. This would work well if only he had remembered his glasses. Meanwhile, back at home, an acting friend (that is a friend who acts rather than one who acts as a friend) has sent me the full person spec for this casting session. It seems, amongst others, they are seeking a hairy, smelly fisherman. How can he not be chosen? The audition moves on to sea shanty singing. Paired with another hopeful, the hairy smelly fisherman of my acquaintance agrees to sing along with the only sea shanty the other candidate knows. The fact that the hsf of my acquaintance only knows every other word doesn’t seem to matter. He joins in, with gusto, complete with actions. Now hsf’s singing is pretty much like mine, great on volume and enthusiasm but tunefulness is open to question. He obviously does something right as, after a call back, he gets the message to say he is required, so our holiday is on hold. We had better get a lifetime’s supply of fish fingers out of this. Whilst on the subject of fame and fortune, the nominees for the Worldwide Genealogy Rock Stars were publicised recently and the list contained many friends and acquaintances. Now the winners of the virtual medals have been announced, I see I got an honourable mention as someone who should have been a nominee but wasn’t. As a friend pointed out, better a ‘should have been’ than a has been. We arrive at our caravan site in Somerset and decide to try out the automatic movers on the new-to-us caravan. They seem to automatically move not a great deal, possible because we are on thick gravel. Back to brute force. The day at the Somerset and Dorset conference was very successful. Nick Barrett, on the future of family history, was the first speaker. Some inspiring ideas about how we can reinvent family history for the next decade. He also stressed that the 1921 census will not be available before 2022. Despite appeals on the grounds of freedom of information, it would require an act of parliament to permit earlier release. Lunch was most acceptable but cold meat, salad and roast potatoes did seem a little unusual. The whole day promoted the need for context for our genealogical data. The second speaker was a fellow seventeenth century historical interpreter who had done an impressive amount of work on Benjamin Blake, a native of Somerset and a brother of the more famous Admiral Blake. It was strange for me to be in the nineteenth century for the day whilst someone else was wielding a musket. My contribution seemed to be well received. It was pointed out that I had mis-spelt Bridgwater on one of my slides. I explained that, of course, this was done deliberately, to keep my audience on their toes. It was one of those venues with a lollipop mike. Never quite so keen on these and they are somewhat incongruous with period clothing; I always feel I should be on X-factor. Unfortunately, for this talk, I need to wear not very Victorian glasses in order to read the delights of the problem pages of The English Woman’s Domestic Magazine. I make mention of Widow Welch’s female pills, advertised in The Bath Chronicle in 1851 and which ‘effectively remove obstructions and overcome all other inconveniences to which the female frame is liable’, whilst being ‘perfectly innocent’ and ‘useful in windy disorders’. Someone in the audience says that these were still available in the 1960s! There was a great deal of interest in the Society for One-Place Studies and all my publicity leaflets were snapped up. Excited to discover later that my talk was being Tweeted by Somerset and Dorset Family History Society. For those of you who think I am still in Leicestershire – surprise! 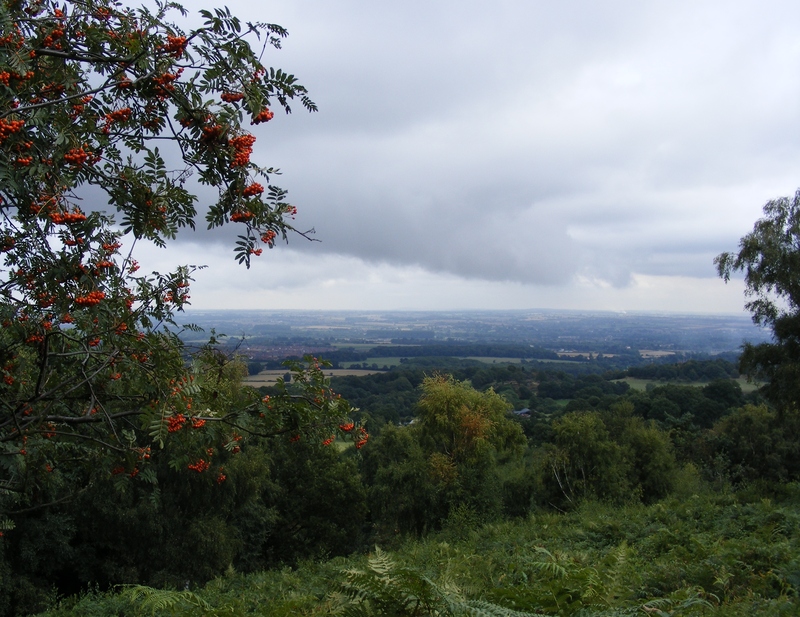 Our last day in the county was spent visiting Beacon Hill Country Park. Here the rocks are 700 million years old – I promised you some history. With our south-west coastal park experience, we opted for the longest of the suggested routes through the park. All I can say is, there is a reason why the word ‘hill’ appears in the name of the park. Actually is was very pleasant and much of it was flat, a distinct lack of wildlife though. I am a bit ambivalent about country parks. They are, after all, a sanitised version of ‘country’. Still, I suppose they do encourage people to get outside and engage with the environment, if only in its pink and fluffy form. Preferable I guess to the land being built on. Once back home, I had this idea, as you do, that I would swap the positions of the two dressers in my kitchen. If you think two dressers is extravagant, there isn’t much else in my kitchen and in fact this move may well be the first step towards there being something else. This lack of kitchen units once landed me in trouble. This incident was so ludicrous it is probably worth repeating. The phone rings, someone who claims they are not selling anything is on the other end. They clearly are selling something. It’s my lucky day, they want to enter someone from my postcode in a draw for a new kitchen. How old is my kitchen they ask? I try to explain that it is a free standing kitchen, it doesn’t have an age. ‘Freestanding’ is obviously a concept that is new to the telesales person; does she not watch the Home channel? Ageless kitchens are clearly beyond the scope of the ‘how to sell a kitchen’ training manual. She tries again, ‘well how old is it?’ ‘Four hundred years’ I say, only slightly facetiously, the house is, after all four hundred years old. Tele-not-really-selling-anything girl is now very confused. ‘Do you have a kitchen?’ she asks. In words of half a syllable I explain that, yes, I have a kitchen but the furniture in it is all different ages. ‘Shall I put about ten years old then?’, she says, hopefully. By now I am in fully obstructive mode. I am, after all, on the telephone preferencing service, she shouldn’t be ringing at all. ‘The furniture is Victorian’, I say, then, to be helpful, ‘that’s about 150 years old’. She gives up. ‘Well you are entered into our draw anyway.’ Oh joy, now I will get a whole load of advertising literature for a kitchen that may have an age but which I don’t want. Have to say, this was almost as good as the salesman who spent ten minutes trying to sell me up and over doors for the garage I don’t have. He couldn’t grasp that, however wonderful, the doors would look pretty stupid standing there with no garage. Anyway back to the dresser moving. As said dressers are on the chunky side, I had enlisted help with their removal. Unfortunately this was help, singular. I emptied the dressers and humanely disposed of all the unwanted and unidentifiable bits of kitchen equipment that had been lurking there for the past five years or so. Where do all these containerless lids come from? My enlisted helper and I exchange the dressers – well we shove at them a bit and they end up in each other’s places. In the meantime, we have removed the dust of ages from behind the dressers. I then replace the contents. I break a few things to make more space. There are still an awful lot of items on the kitchen table that now don’t fit in either cupboard – how can this be? Have the cupboards mysteriously shrunk? Before we leave these domestic ramblings, there has also been the mysterious incident of the shower in the bathroom. That is not THE shower you understand, which is perfectly well behaved and where it should be. This is another shower, of rain, which is pouring down the walls. Currently a builder is coming to look at it – not sure when – manana is his middle name. In the meantime I am ignoring it and hoping it will go away – not working yet and heavy storms forecast. NOW the history. Corrected Family Historians’ Enquire Within are on their way back to the printers at last. Hopefully it will be available in time for Santa to pop a copy in your stocking – you won’t want me to say this but 99 days to – oh I wasn’t going to say was I! Now to the next book, which is to be about One Place Studies. The new society of the same name, with which I am involved, is gaining a great deal of support, as is Buckland Brewer History Group. Whilst on the topic of one place studies, do take a look at this pod cast on The National Archives website. I’m in the midst of another ‘five talks in a fortnight’ session and next year is filling up fast. Two one day courses for Devon Family History Society are on the calendar for early next year. I also managed to join the Braund Society reunion in Canberra. It was a virtual presence but great to say hello to everyone across the miles. Up early for a day at the Halsted Trust’s ‘Exodus: Movement of the People’ conference. Great to chat to old friends and new and meet family historians from all corners of the globe. Especially pleased to meet some of my overseas blog followers. Advance news (or should that be warning? ), if all goes well, I am hoping to visit Canada in the autumn of 2015. I have already had some requests for talks and I will be delighted to fit these in if I can. First I listened to Peter Park, speaking about rural to urban migration, using Cumbria and Liverpool as his case study. In the light Of my visit to the area last year, this was particularly fascinating for me. I sat the next session out and caught up with the latest news. There was a great deal of interest in our Society for One-Place Studies and membership has grown rapidly over the weekend. I had a good audience for my talk on Devon emigrants and some very positive feedback afterwards. Finally a brilliant session from John Titford on migrants who bounced back. I have known John for more years that either of us would like to admit to and this talk was delivered in his usual, wonderfully dry, humorous style. The research he was describing involved what he called ‘genealogy for grown ups’. I would call it ‘family history for grown ups’ but I am so with him on this one. All about looking at lesser known sources in original form at Record Offices in order to investigate the context for our ancestors lives. Well done John – a tour de force. Back in the van I find that I have somehow acquired a remote control for a digital projector – oops. I could claim I thought it was mine, which is after all exactly the same. In truth I just didn’t think at all. Leaving Leicestershire today, we head for Southwell Workhouse in neighbouring Nottinghamshire. We arrive in time for the before hours ‘Welcome Tour’. This is very interesting and takes us round the outside of the premises, to see parts that self guided tours do not reach. This is an early example of a rural Union Workhouse, which opened in 1824 to serve forty nine parishes. Established as a result of the provisions of the Gilbert Act of 1782, Southwell became a blueprint for the post 1834 Poor Law Union Workhouses. I am tempted to put in a mention in for The Isle of Wight Union Workhouse, which predated this one. Although very similar in style and regime to workhouses in large towns, this is on a much smaller scale, designed for 158 inmates. Although the lifestyle was spartan, it was significantly better than most inmates were enduring on the outside. We view the dead room where bodies were kept, often for some time, whilst awaiting collection by their parish of origin was right next to the room where inmates were held in isolation as a punishment. The supervised part of our tour is over and Martha and Rob have come over to meet us. 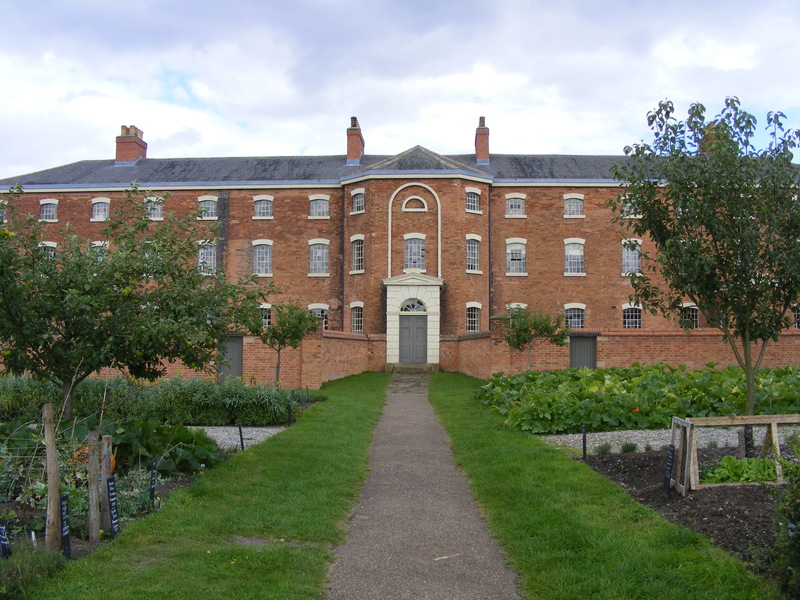 We explore the symmetrical workhouse and neat vegetable garden. Chris is struck by the similarities between workhouse life and an institution with which he was closely involved in his working life. The mangle room is on an upper story, as our guide pointed out, clearly designed by a man. We are struck by the facsimile of the punishment book, recording only two or three punishments per year. As these include minor misdemeanours such as ‘profane language’, this seems strange. Maybe they wanted to give a favourable impression for the inspectors. Despite the infrequent entries, the names of repeat offenders are in evidence. The able-bodied men would crush stones, I know what that’s like from my spell in the Neolithic era, or pick oakum. This would be sold to make ‘money for old rope’ on behalf of the workhouse. In the absence of anything more productive to do, the men would turn a crank. This served no practical purpose but stopped them from being idle. I’ve received a strange request. Could the photograph I took at Bambrough last year be used as a background for a visualisation by wind farm protestors? Flattered though I am, I can’t help wondering why they don’t just take their own. I do say yes but I am a bit ambivalent as I am, in general, a fan of wind energy. The trouble is, the wind farms need to be in the right place. Sadly, any proposal is always in the wrong place for some. Off in the new-to-us caravan again. Chris has rediscovered the blueberries that went missing on the last trip. That was six weeks ago. I am not a great observer of ‘best before’ dates but even I have to admit that they are now a little past their best. Bowling along the M5 we see a chicken on the hard shoulder. At this point in time it is an alive chicken. This is perhaps taking ‘free range’ to extremes. We arrive at our Leicestershire destination with comparatively little incident – just a minor detour at the very end. The camp site is hidden from view by some serious looking security gates. Chris has to speak through an intercom for them to be opened remotely, allowing us to enter. We are now in a field in the middle of nowhere, next to a very impressive new property that appears to rate two gardeners. We are wondering if we will ever be able to get back out through the security gates, or if we have been kidnapped for nefarious purposes. If we do manage to escape, what happens if we want to return and there is no one to press the ‘open sesame’ button? Chris is trying to get a TV signal. This caravan is all singing, all dancing, full of technical gadgets but lacking in instructions as to how these might work. We now have an external TV aerial – the previous caravan didn’t rate one of these. Chris needs his reading glasses to look at small print on an awkwardly positioned control box. It seems his glasses are in a cupboard with a sliding door. In transit, something has fallen down, covering the channel inside the cupboard into which the door needs to slide. The cupboard now seems to be irretrievably hermetically sealed. A bit of judicious jiggling with a kitchen knife and we have gained entry and are back on task. After a certain amount of head scratching and plugging numerous aerial cables in to the aforementioned awkwardly positioned box affair, in various combinations of sockets (Krypton Factor here we come), no television. I am not so bothered as I am too busy being excited by the discovery that, despite the remote location, I have achieved an internet connection. Not too sure whose connection I am hijacking. It appears to have the narrowest bandwidth in the world but it is an internet connection of sorts. Meanwhile, Chris has solved the lack of television. It seems that some incompetent (ok me) has plugged the aerial in the wrong socket in the television itself and the cables in the inaccessible box were right all along. Next day and we are off to the Bosworth Battlefield Heritage Centre. We have already established, thanks to Tripadvisor, that this is not actually on the site of the battlefield at all, so that won’t be a disappointment. In fact the received wisdom concerning the exact battlefield location has changed over the years. It is raining, quite a lot, so we do the indoor bits first. The exhibition has obviously had serious money thrown at it and is interactive and impressive. The story is told through the eyes of three fictional characters and Thomas Stanley. One is ‘Colette’, allegedly the wife of a French mercenary, who sound as if she has stepped out of ’ello ’ello. She does stop short of saying ‘I will say this only once’ but only just. We linger in order to avoid a school party that is being supervised by Joyce Grenfell. We throw ourselves in to the interaction with gusto. A surprise discovery, apart from an attempt by Genghis Khan, carrier pigeons were not used until the nineteenth century. My son in law has obviously been here. An interpretation board referring to ‘less than 1000 knights’ has been corrected to ‘fewer’. We can’t resist trying on armour. These are a more realistic weight than our seventeenth century versions. Chris does an impression of man in the iron mask and is surprised by the lack of vision from the helmet. Then a chance to see how good we are at pulling a long bow (2 fingers only allowed for this). I have done archery before but I am amazed that my pull equates to a 220 metre range. The maximum, which Chris achieves, is 240 metres. Maybe it is rigged to improve visitors’ self esteem. The Battle Story presentation brings it home just how critical the role of Thomas Stanley was in determining the outcome. The terrain clearly played its part as well. We then venture outside, where the rain has abated somewhat. We follow the 2km Battlefield Trail, wondering why the advice is that this takes and hour. 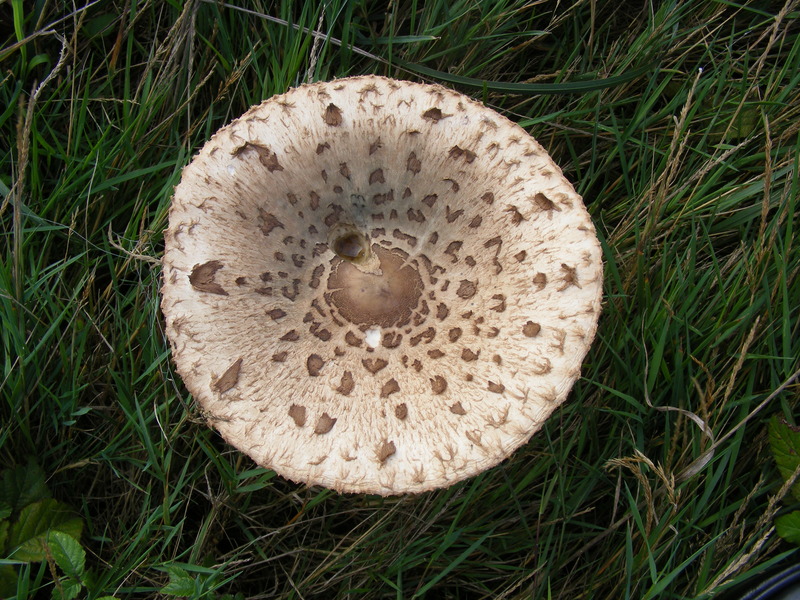 This takes us through Ambion Wood – a corruption, apparently, of Anne Beame. Then on to Leicester itself to see if we can find THE car park. We find A car park. Not, it turns out, THE car park. Further investigation round the old part of Leicester takes us to the Cathedral. 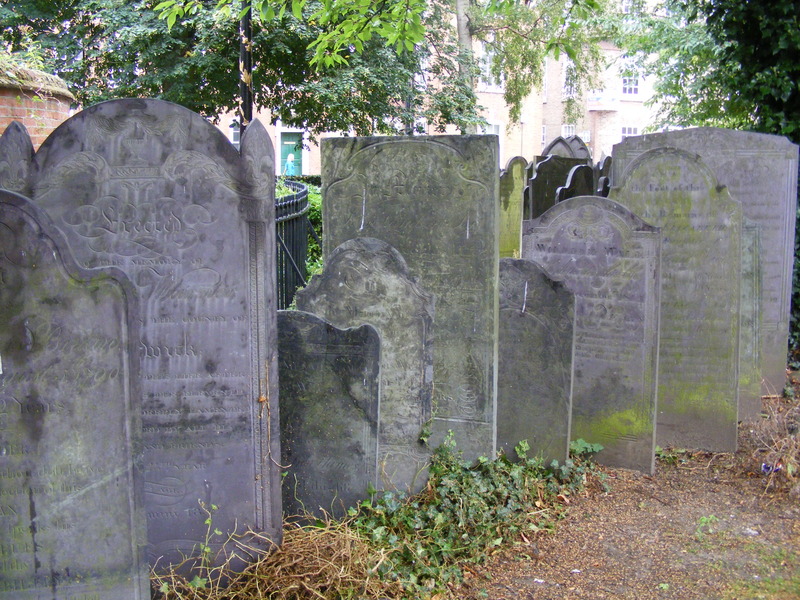 The gravestones have been rearranged, rather strangely, one behind the other, with only a few inches’ gap between them. This makes reading them difficult and photographing them impossible. We see the Guildhall, parts of which date back to 1393. Finally, THE Greyfriars car park. Back in the van and my shoulder is hurting. I suspect a longbow related injury. I really should be less competitive.